With the Petite Heure Minute 35 mm watch, Jaquet Droz forges an unconventional steel and mother-of-pearl tribute to contemporary femininity. 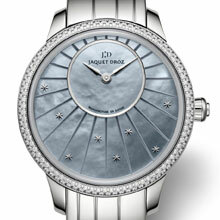 For the first time, the workshops of Jaquet Droz have opted for a woman's watch all in stainless steel. In pairing this metal with a new timepiece, it contrasts with the radiant dark blue mother-of-pearl and the light of the stars. The high quality mother-of-pearl is delicately worked and cut into a single disc in an array of light-catching hues that vary with the movement of the wrist: royal blue, ultramarine, cobalt or indigo. The eight stars, a signature of the brand, are scattered across the dial in a truly spectacular display, much like the beauty of a night sky. The harmoniously balanced integral steel bracelet is exceptional; the design is the outcome of long research and precise workmanship. Both a technical and aesthetic challenge, its form is subtly asymmetrical. The different sized links blend into a single line that encircles the wrist. 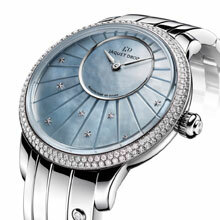 Two diamonds emphasize this timepiece’s impeccable elegance, made to celebrate the beauty of women. Uniting the splendor of the sun and the mystery of the night, the Petite Heure Minute 35 mm combines the symbols of femininity in this imaginative jewelry timepiece, the new creation in the Élégance Paris collection. This new tribute to the women of today also reflects the best of contemporary watchmaking: a Jaquet Droz 2653 self-winding mechanical movement, a power reserve of 68 hours and a bezel set with 160 diamonds.